As millions of Kenyans casted their votes earlier this week for the presidential election 2013, the United States of America today applauds the Kenyan people for participating peacefully in the March 4 national elections. In a press statement in Washington DC, Acting Deputy Spokesperson Patrick Ventrell says although there were scattered acts of violence in two areas of the country, the vast majority of Kenyans voted in a calm, patient, and orderly manner. According to Mr. Ventrell, the final results are not in. However, Kenya’s Independent Elections and Boundaries Commission is in the process of tallying the ballots and we expect final results soon. 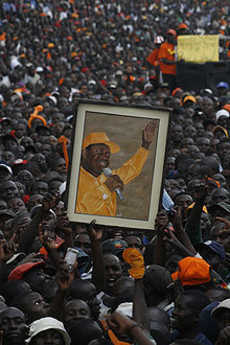 Orange Democratic Movement supporters at a rally during the 200708 Kenyan crisis. The US encourages all Kenyans to come together and move forward peacefully to realize the full promise and benefits of the new constitution. US also urges that any election disputes be resolved peacefully through the Kenyan legal system. Mr. Ventrell also points out it is critical that Kenya avoid the post-election violence that marred the December 2007 presidential contest. Despite fear of an outbreak of violence, voter turnout on Monday was reportedly tremendous. Reports say voting was slow in many places but orderly and was peaceful. This is Kenya’s first presidential vote since 2007 where the post-election became bloody where ethnic clashes began to erupt, leaving more than a thousand people dead. 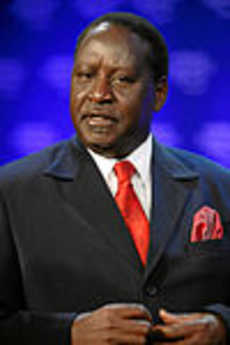 Kenyans were worried that history could repeat itself if this elections will be marred again with fraud and violence. Who will win the presidential election? 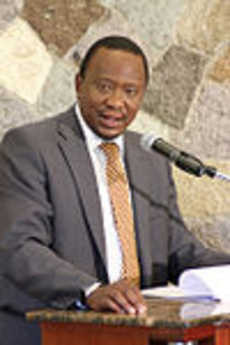 Reports say Uhuru Kenyatta is predicted to win the election based on tentative results. Mr. Kenyatta has been indicted by the International Criminal Court on charges of crimes against humanity and may face a trial this year at The Hague. Thought the results are not yet finalized, Mr. Kenyatta’s lead is said to be strong from the moment the first tallies came in. Reports say Kenyatta’s lead is raising concerns about his upcoming trial where he was allegedly accused of crimes against humanity. Kenyatta’s main competitor in the presidential race is current Prime Minister Raila Odinga who ran during the 2007 election but lost to then-incumbent Mwai Kibaki. Post-elections violence rocked the country following the last presidential vote in 2007, killing at least 1,200 people and over 300,000 have been displaced since December 2007 elections in which President Mwai Kibaki was declared the winner over opposition leader Raila Odinga. This time around, new electoral institutions were in place. Tens of thousands of security men were out in force across the country, government officials on all sides are making it a point to call for calm, and the Independent Electoral and Boundaries Commission – established under the 2010 constitution – is overseeing the tally. Kenyatta, the son of Kenya’s founding president Jomo Kenyatta, went up against seven other candidates on Monday. Kenyatta’s early lead is raising concerns about his upcoming trial. He is accused of helping to organize and fund violence following the elections five years ago, a charge he denies. The Office of the Spokeperson of the U.S. State Department today announced that International Criminal Court (ICC) confirmed charges against four Kenyans for their alleged roles related to the deadly violence that swept Kenya following the disputed December 2007 Presidential election. The four who have had their cases confirmed include: Uhuru Kenyatta, William Ruto, Joshua Sang and Francis Muthaura. Hussein Ali and Henry Kosgey’s cases were not confirmed with the judges citing lack of overwhelming evidence. According to the State Department, under the ICC process, individuals are presumed innocent until proven guilty. The U.S. State Department explained that in the spirit of Kenya’s new constitution, which embraces transparency, accountability and integrity, it urged the Kenyan government, the people of Kenya, and the individuals involved to continue to cooperate fully with the ICC proceedings and to remain focused on Kenya’s future, especially through implementation of the reform agenda. The State Department stressed that the United States is committed to continuing to support Kenya’s ambitious reform process as Kenya looks ahead to its first national elections under the new constitution.